Overview: Creo Training – Industrial Design will empower industrial designers to use Creo at a high level in just over an extended week. This 56 or 80 hour Creo traiining class would be beneficial to any industrial designer who already has an understanding of Alias Studio or Rhino 3D and understands the basic surfacing techniques required to develop stylized products. Participants will undertake at least ten tutorials specifically designed to form a strong foundation within the Creo constraint based modeler. Creo Level 1 training is an introduction to constraint based modeling utilizing Creo 5.0 the latest release of Creo. This course will cover our Creo Level 1 and Creo Surfacing Level 1 through 3 and Creo Style 6 or 7 (was ISDX) all in seven days. This class is best administered in two weeks or 80 hours. Prerequisite/Assumptions: Designers attending this class should have a degree in product/industrial design and possess an understanding of surface modeling using Alias Studio, Rhino 3D or any other surfacing package so not to hold up the flow of this curriculum. Onsite Training: This and all Design-Engine courses are offered onsite at your facility. Call to speak to an account manager to arrange a class 312.226.8339 today. Topics: Part Mode Assembly Mode customize environment/map key development creating features. Protrusions, Sweeps, Patterns, Shell, and Draft. This part of the course is to get the industrial designer up to speed running Creo 5.0 and comfortable before surfacing. Discuss Sweeping draft as apposed to the Draft Tool & discuss Pull Direction with examples. Use Modify, Edit References, Insert Mode, Reorder edit references, and utilize edit definition. Learn to redefine parts (with certainty) that others have modeled. Learn to use drawings not only to document but as design tools ie. drawing over etc. Discuss the engineers responsibility for capturing form from an ID deliverable or foam models and discuss techniques for creating advocates out of engineers for developing an ID/ME team. This portion of the training will focus on the basics of constraint based modeling and using drawings as design tools. 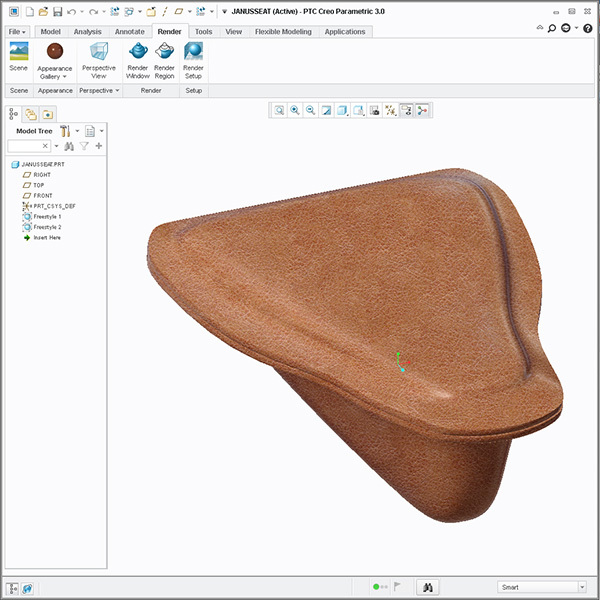 Using all your experience from Alias Studio, Solidworks, or Rhino 3D these two days of parametric surfacing and one day of free form using ISDX will be an intensive covering learning Creo modeling workflow. Discuss light reflections for interpreting form. Use extrude, sweep, and free form surfaces. Discuss the basics of four part boundaries and discuss problems with 3 part boundary. Manipulate a curve through points using NURBS modeling techniques (TWEAK). Merge, Trim, Offset, Transform, Replace and Extend surfaces. Create solids and cuts using surfaces. Utilize new skill sets to smooth out solid material from problem areas and to force rounds. Introduction to lattice structures for building more robust curved surfaces. 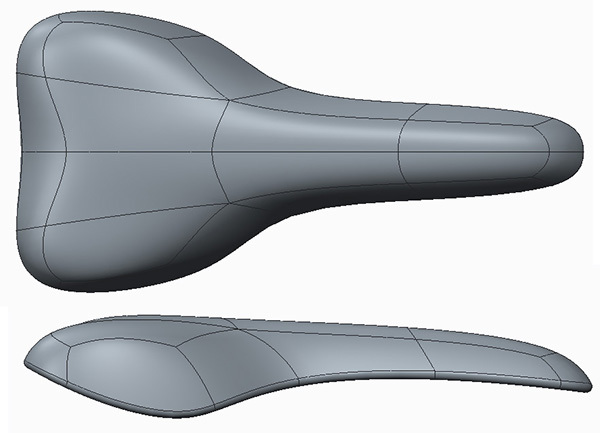 Eliminate isoparms (KNOTS) and discuss tangent and curvature issues in detail. Discuss managing flow or striation of surface. Discuss in detail the industrial designer’s role in proving form as opposed to capturing form. Discuss precisely what deliverable should be required for engineers in relation to the design field. Also, discuss design teams techniques and their deliverable to the engineering department. Present curvature and define Class- A surfacing. A portion of this training will focus on ideation and proving form inside Creo with both parametric Surfaces, Style & Free Style. Projects: A wide assortment of Creo tutorials will be offered. Prerequisite/Assumptions: Participants should have a degree in product/industrial design and possess an understanding of surfacing in Alias, Rhino or any other surfacing package. Specific to industrial designers learning Creo, this class is a serious introduction to constraint based modeling, assembly, detailing, surface modeling & making changes utilizing the latest release of Creo. This Creo training course is developed for specific seasoned industrial designers users who want to become proficient learning Creo all in this seven day intensive. We help you learn Creo, not read to you from an exercise or book. In this course we help design engineers learn how to make changes quickly to set them up for becoming expert faster especially with their previous Alias or Rhino 3d experience. As with all Design-Engine classes, participants keep the training material login and password for life. *Please note that prices listed on this page are based upon pre-payment prior to the start of the class.